Disney Animation's first ever VR short, "Cycles," will make its world debut at Siggraph 2018 in Vancouver. The experimental film, from director Jeff Gipson, centers around the true meaning of creating a home and the life it holds inside its walls. I was wondering whatever Ralph will get a short or not. Glad to see it does. We don't know that yet. Disney's "experimental" shorts that premiere at Siggraph don't usually see the light of day (e.g. Pixar's Smash & Grab). While I find VR interesting, I'm not sure if it will ever replace a theatrical experience since it will look exactly the same at home on you own couch as in a theatre. But as a meditative experience or something, I would love seeing a properly done VR-movie. Like an invisible tourist floating through an impossible landscape. The premise sounds intriguing and I like that they are experimenting with new techniques. I just hope it doesn't suffer the same fate as "Glago's Guest", which hasn't been released yet to the general public. From the filmmakers' Instagram accounts. So stoked to announce the amazing opportunity I was given to DIRECT Walt Disney Animation's first VR Short Film! It has been an incredible journey working with the best artists in the world to tell a story close to my heart. Thank you to everyone who has worked, hustled, innovated, and put love into the film. Check it out at ACM SIGGRAPH in Vancouver Aug 2018. Here are our main characters Bert, Rae, Rachel, and Bruce designed by the amazingly talented Meg Park. Working with these characters has been a form of emotional closure, telling a story I hope that many can connect with. Bert and Rae are named after my grandparents, Rachel after my dear friend who took her life 11 years ago. Production designer Dan Cooper's beautiful concept of the Disney Cycles house. When I pitched the story to Dan I told him to "imagine a mid century home mixed with a grandma's 60s/70s home vibe". The house is a main character in the film which evolves and changes. Absolutely love what Dan brought to the project! Painted over a great sketchup model done by Cycles director Jeff Gipson. We were pushing for severe foliage design and adding charm and curves into the set while still maintaining the mid-century modern feel. Colors also evocative of the period. Very much a team effort honoring Jeff's grandparents. I'm proud to have been a part of this first VR short film by Disney Animation. Color script from Jeff Gipson’s short, Cycles. Mood and emotions were critical in this brief but moving experience. Throwback Tuesday to premiering Disney Animation's first VR short film "Cycles" at ACM SIGGRAPH. Excited to show at New York Film Fest Convergence in October! Getting stoked for the US premiere of Disney Animation's first VR short film "Cycles" at New York Film Fest this weekend! If you are in there area come check it out. Myself and some of the crew will be there hanging out! Here in NYC for the New York Film Fest. 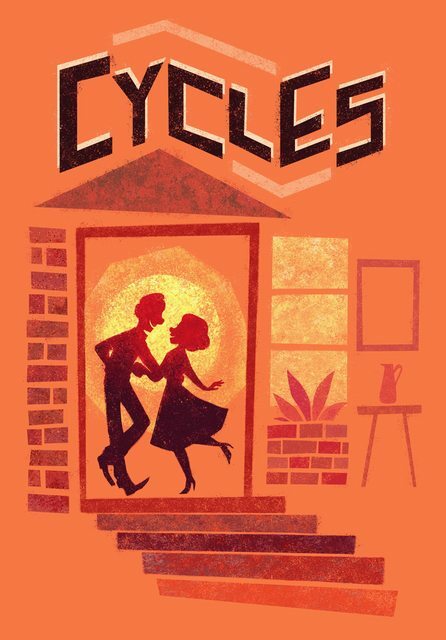 Excited to share Disney Animation's first VR short film “Cycles” for our US premiere! If you are in the area come by and hang out. Swipe to check out an image from the short animated by Jorge E. Ruiz Cano and an image of my grandparents — Bert and Rae — that inspired the moment. It’s been so cool to tell a story inspired by them and share it with audiences. Disney Cycles crew speaking in Barcelona at B'Ars VFX. Such an amazing trip! Disney Cycles at the Sundance Film Festival. So stoked to be here! If you are around DM me come check it out and I’ll get you a pass! Disney Cycles at the Sundance Film Festival. Stop by to see Disney Animation's first VR short film and our accompanying AR projects. The story sounds good and perfect for the VR technology. And I like the idea they had to guide the audience’s eye throughout the short. By the way, I’ve just realized that, unless Disney has made a version without VR, this short can’t be released in front of Ralph Breaks the Internet in theaters. Sorry if I'm sounding really silly ... what is VR ? Virtual Reality ? Yes, VR means virtual reality. I understand that it can look amazing, but personally I prefer seeing shorts and movies the conventional way. I did see a VR-short without a plot some time ago; it was just a visual CGI-documentary about early marine life in prehistoric times, and loved every moment of it. For those of us who have zero interest in computer games, this is how the technology works best. As a meditative travel through an peaceful landscape. There is no need for a story or anything. You're just floating over and through extraterrestrial ecosystems, or prehistoric planets, anthills and termite mounds while you are in ant-size, the deep ocean, the surface of Mars or a futuristic city from science fiction. New still and interview with the director. Every home tells a story. Experience "Cycles," Disney Animation's first-ever VR short film, making its U.S. debut in the Virtual Reality Arcade New York Film Festival's Convergence this weekend! I guess they wanted to give the characters a painterly look, but they look like porcelain figures. I suppose it’s the combination of 2D and CGI. I like their design, though, and maybe they look better in motion, we’ll see. I guess they wanted to give the characters a painterly look, but they look like porcelain figures. I suppose it’s the combination of 2D and CGI. I don't think there's any 2D in it. It's just non-photorealistic rendering and lighting. OK. Then that's what makes it look strange to me. I appreciate they are trying new techniques though, and as I said, it will probably look better in motion. An innovative collaboration between technology and animation, PoseVR is an experimental project developed at Disney Animation to demonstrate the potential of virtual reality as a tool to pose and animate CG characters. The tool was used in the production of the VR short film, "Cycles," which makes its U.S. debut at New York Film Festival October 13-14. At New York Film Fest? Come experience "Cycles," our first-ever virtual reality short film at Convergence today! This weekend, the filmmaking team behind our VR short Disney Cycles took to Sundance to share this unique story with festival goers. Based on those two screenshots (both from different angles) it actually looks like real-time rendering to me, as in videogames. I thought something similar when I first saw the pictures. It looked like unfinished animation to me. Bao has been added to the Disney Awards site but not Cycles. I guess it's probably not eligible since it hasn't premiered or been shown on a normal theatre screen, is that right? By the way, I loved Bao. I think it's one of the best Pixar shorts in recent years. I hope it's nominated.